After months of neglect interspersed with brief periods of enthusiasm, I had about 50g left to spin, and then that and another bobbin’s worth to ply together, and I’d be done. As it turned out, the dreaded lurgy held on just long enough for me to knock it out, and now I know why it took so bloody long (apart from the long stretches of not-spinning, which we won’t mention): once plied, it came to 2378 yards of yarn. That’s 2174m. That’s…rather more than I expected. I’m delighted, to be honest. 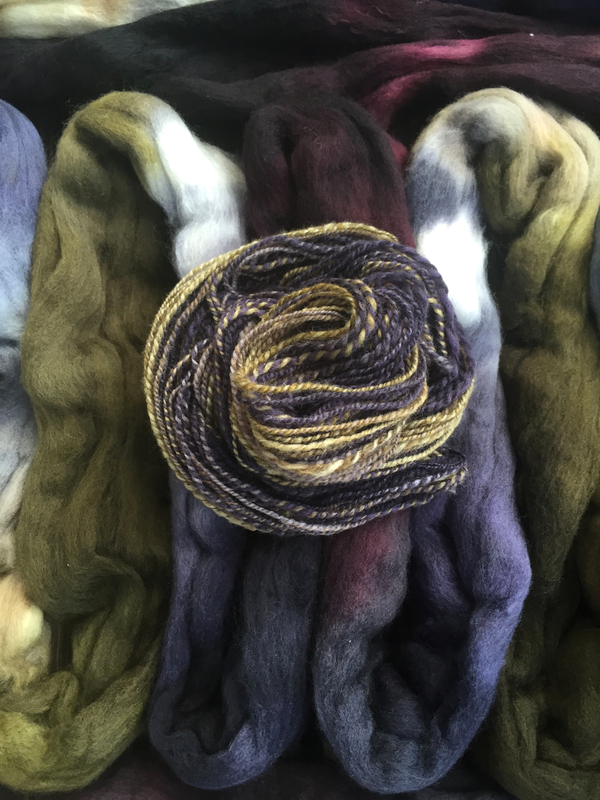 I’d started to doubt the wisdom of using wool—even wool with a lot of silk, in a yarn that’s 17 wraps per inch—for a summer top in a climate where ‘summer’ means ‘3-4 months in Satan’s armpit after a particularly brutal day in the brimstone pits’. This yardage means I can make something with sleeves, which means I can wear it the rest of the year in comfort. The knitting will take a while (though hopefully not as long as the spinning); judging by the sample swatch, though, I think it will be worth the effort. 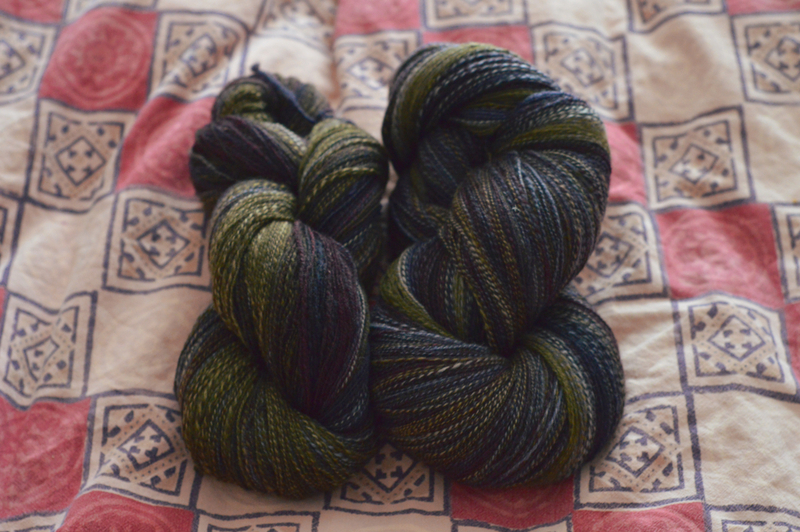 For those who are wondering, I spun these skeins long draw from the fold, hence the insane yardage. The fibre came in 3 bags, which I labelled 1, 2, and 3. I divided each bag’s fibre into colour repeats, and for the first singles I spun each repeat as it came, alternating 1, 2, 3, 1, 2, 3 until the bobbin was full. For the second singles I divided each repeat lengthwise into 3, and spun each third 2, 3, 1, 2, 3, 1 until the second bobbin was full. 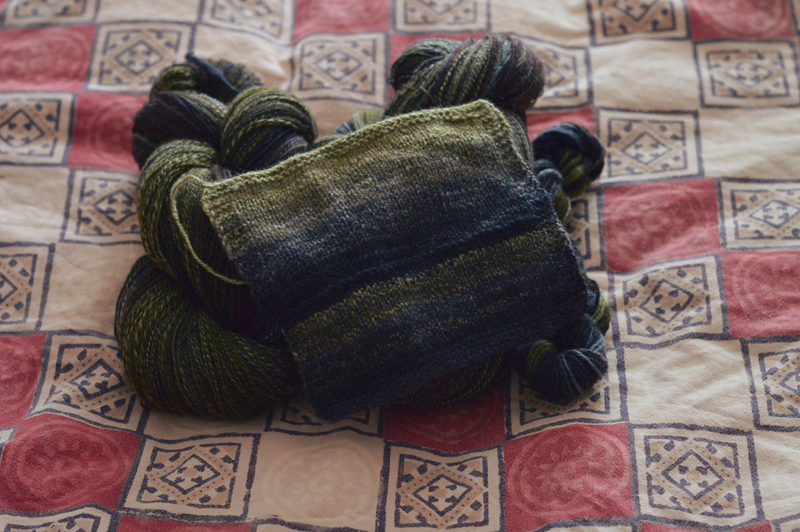 I plied these together, then did the same with the remaining fibre. The wee skein in the top photo is the leftover singles, chain plied, which came to 84 yds/77m at 14 wpi.